This combination machine was built in Domfront in Normandy by Lurem but badged as Metabo. Each machine is built by one engineer, but the electrics are fitted by another operative, the purpose of this process being to build in quality control. The Optal 26 has been around since 2001 but now sports cast-iron tables. There are three motors and function changing is by selector switch. 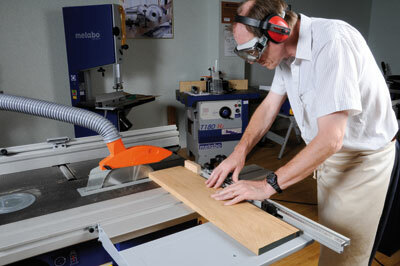 I took a sawn oak board and prepared it on the 260mm-wide surface planer. The fence is an aluminium extrusion clamped by a simple and robust pressure pad which was easily set. Sadly the fence has no angular adjustment; there are two settings, 90 degrees and 45 degrees, with no increments in between. Guarding is easily operated and effective. The block carries two knives held in place by the usual wedge-and-bolt system and the machine is supplied with a knife-setting jig. Dust extraction is via a plastic hood held in place by the thicknessing table. 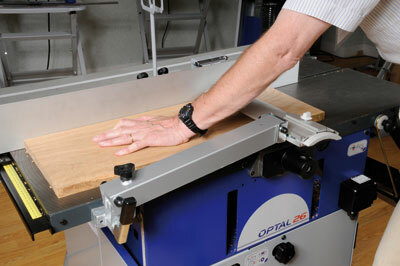 The Optal had no problems with the oak on the surfacer using a fine 0.5mm cut. Even before Metabo took on Lurem their spindle moulders seemed well sorted and this one is no exception. A spindle moulder is essential to the way I work, so having a fully functioning spindle included in the machine is a definite plus. It has a single-speed, smooth, quiet motor. The hood/fence assembly is a standard Lurem item and functions as expected. Just remember to add in the cost of a decent lot of tooling! Then I moved to thicknessing. Maximum height is 150mm. No tables to lift, just flip up the hood and locate a lip under the rear table. Lower the thicknessing table and zero the height-adjusting wheel. Put the timber into the thicknesser: hang on why is nothing working? I had forgotten to engage the feed roller. That sorted I had to find the thicknessing aperture again. It is a bit hard to find, sounds silly and I suppose you'd get used to it, but I found it difficult to get the timber into the aperture without bending down to watch what was going on. Also, the timber emerged at the outfeed end with a small ridge on one edge. 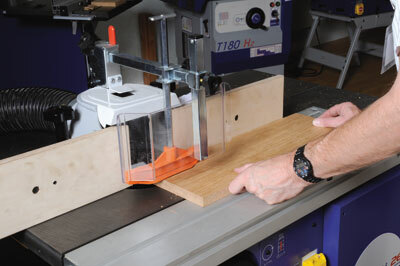 Close examination with the power off revealed that the thicknessing table edges are made from bolted-on sheet-metal strips which can allow timber to oversail the ends of the planer knives by approximately 0.2mm. Metabo are looking into this problem to discover if it was unique to the machine we tested. One solution would be to move one knife slightly to the left and the other knife slightly to the right when setting up. A slot mortiser can be fitted to the thicknesser table but we removed it to ease walking from the infeed to outfeed end of the planer. It is, though, a useful accessory if you don't own a square chisel mortiser. 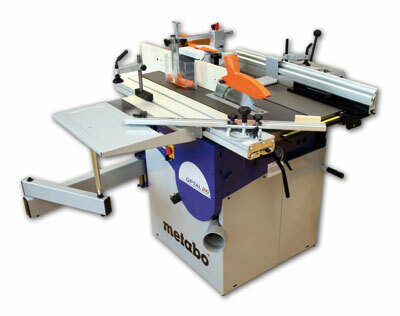 There is no 'dead spot' between the planer tables and the saw table and the maximum distance from blade to fence is 420mm. Ripping was troublefree but I did have to reach around the sliding carriage to operate the start button. 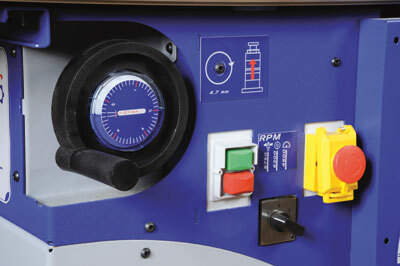 The controls would be better placed near the operator end. 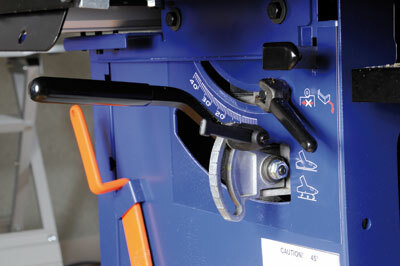 The crosscut fence has a sprung stop which saves resetting when cross-cutting both ends of components. Blade changing was easy and a spindle lock bar is standard. The below-blade dust extractor hose is rather short. The sliding beam is positive, the cross-cut guide has plenty of adjustment and the extension table is easy to fit. A convenient spy hole is drilled to ease the location of the table onto the swinging armrest. Anthony and I both feel that combination machines are a compromise that should be avoided if you have the space and funds for separate machines. Assuming that the setting-up problems can be overcome, this is a neat little machine that would be very useful in a small workshop, but do your sums first and check that you cannot buy the separates from Metabo. "A convenient spy hole is drilled to ease the location of the table onto the swinging armrest"